Dears, I've fallen in love with this story. And felt a joyous urge to share it with you..Am imagining it as a book..a book for both children and adults to enjoy...this Griffin and his wondrous imagination...perhaps you, the reader, might share this with the children in your life..
the ballet. Also thanks must go to Madame's dear friend Emily Wood whose painting is also involved. A long time ago, sometime in the 18th century there lived a little girl called Janie Jones. She lived with her mama and papa in a tall house in London. This house was itself old and within its secret nooks and crannies at least four families of very civilised mice moved about the house; indeed from there they would also move about many of the old houses of London. They were highly cultured and on the shelves of their tiny homes were many tiny books on subjects of all kinds. On their tables they ate from the finest silverware and drank from the finest glasses. A mouse along the street from them made their clothes from the finest scraps of Spitalfields silks and French velvets that her tailor would store away. Janie's father was a maker of violins to the gentry and he also played the violin. At night, before he closed up his workshop, he would sit among the unfinished instruments and the sawdust and wood shavings. He would rosin his bow and play soft and gentle melodies that drifted up the stairs into Janie's bedroom and lulled her to sleep. Her cat Grimwade would curl up at the foot of her bed asleep, yet his ears were pricked for every sound that came from behind the wainscoting and in the cupboards. He was all that the mice feared and his fur was dark tabby coloured, his eyes were like two full moons and his claws like crescent moons. One day a little before Christmas a very fine gentleman came to visit Mr Jones to commission a violin. He was a tall, thin, very elegant Frenchman and his coat was of fine damask. Mr Jones called his wife Madeleine who was fluent in French and through her he asked if the gentleman played the violin himself or was buying the violin for another. The gentleman replied proudly that he was buying the violin for the Duc de Maurilhac from one of the finest families in France. Mr Jones raised an eyebrow in surprise and assured the gentleman that he would ensure that the violin would be suitable for the Duke. The gentleman bowed, thanked Monsieur Jones and left giving Madeleine his card and telling her that he would be staying at the Savoy hotel. Now listening to this was a young mouse called Melissa Mouse and for her father's birthday some months ago she had invited the mice including her dear papa to the workshop to listen to Mr Jones play. She had also learned, as many mice her age, how to write music and how to play it. She had written a delicate piece in human size with her tail dipped in ink and left it for Mr Jones to find. So Mr Jones had played Melissa's mouse music with some amusement that very night. She tried to imagine the violin that would be fit for a duke and knowing that Mr Jones would play the violin before he sold it, she began to think very hard. Finally she scurried away and stole some sheets of music paper from Mr Jones' store. That evening in the attic, she began to make notes. But it was no good. She realised that would have to visit Madame La Rosbif of the Dancing Mouse Academy. She put on her muffler and a fine dress of rose silk and old lace as well as her best bonnet. Then she travelled through the attics and down through the cellars of some of the finest houses in London until she reached Drury Lane. There, in the attic of a certain theatre, she called upon Madame La Rosbif. She was led by a young mouse through the dancing studio to fine apartments where, upon a chaise longue reclined a genteel lady mouse in a satin dress and a long lace over gown. She sighed fashionably when Melissa was announced. 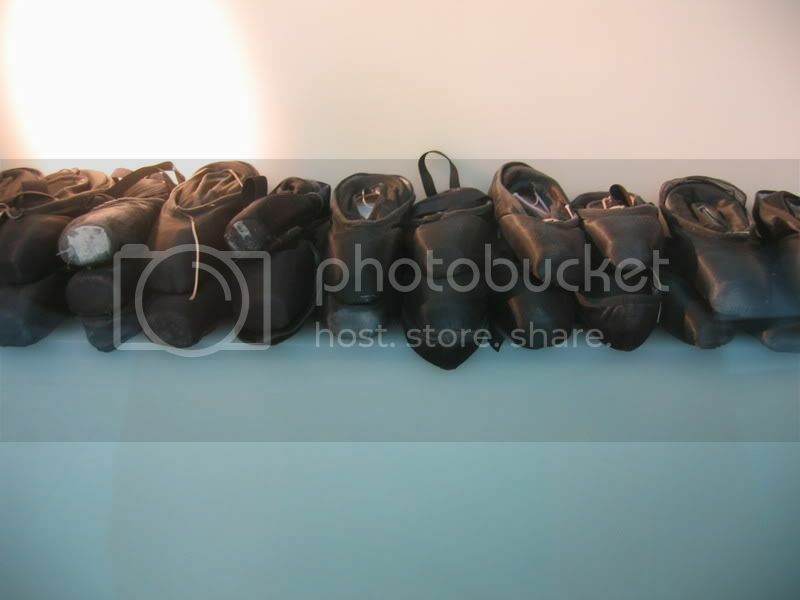 It seemed that Madame La Rosbif was in despair for her students had no more ballet shoes. Her star ballerina, Fleur Morceau was in tears for her own shoes had fallen into shreds with all her dancing. 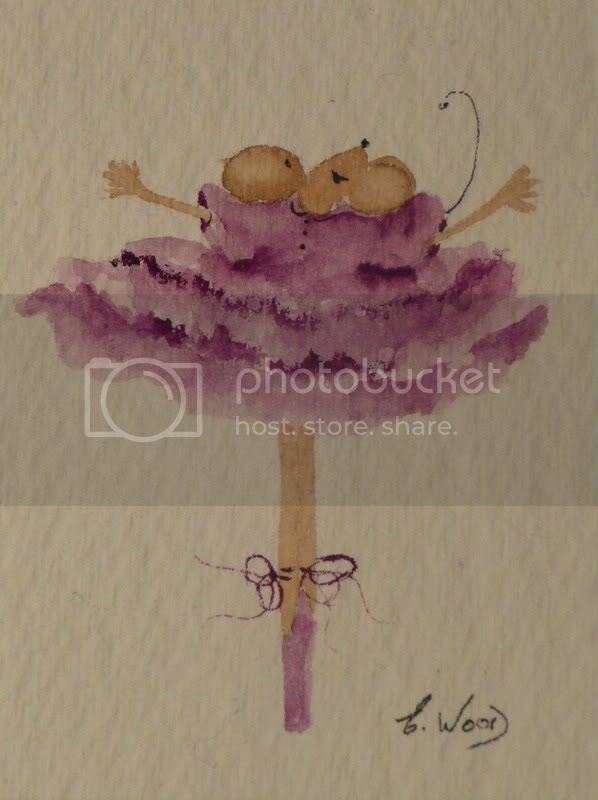 "My dear your ballet is di-vine," Madame told Melissa, "But what can one do without shoes. One cannot dance the ballet in bare feet, think of the scandale! It would be so inelegant as to be unfashionable! I should simply die of shame. If you can find me a hundred ballet shoes in brown or black with one fabulous pair in pink for my dear Fleurette, then I shall promise you a ballet incomparable!" Madame gushed. Then with little hope she fell back in a genteel swoon on the chaise longue. Melissa left deep in thought. She went out to Ministrellis in Covent Garden and begged him to help. Signor Ministrelli was a lively mouse with moustachios and a deeply thoughtful air about him. He could only show Melissa a heap of secondhand ballet shoes. But to her delight they were in quite fair condition. Sure, they were a teensy bit worn, but otherwise very serviceable, very serviceable indeed. Now she needed only a single pair of pink shoes for the ballerina. Signor Ministrelli had only recently made a charming pair, but the cost was at least a hunk of Gorgonzola which he missed greatly. Melissa promised to see what she could do and invited him and his charming family to the ballet. "Cousin, you came to the right mouse. Leave it to me. I know what Ministrelli likes. Your Madame La Rosbif shall have all the shoes and costumes she requires." Melissa was most grateful and left her cousin promising to visit more often. She returned to Madame's Academy and left a message that the shoes would be there and in the meantime, would it be too inelegant if the students might perhaps practise in bare paws until the shoes were ready? Madame emerged in a cloud of lace and perfume. She was thrilled to be of help. Of course her students would practise in bare paws. The Mouse Ballet would be ready in three days. Melissa was glad of this for it would take Mr Jones some time to make the violin. Roxanne gathered the Gorgonzola, some Parma ham and olives. These she took to Ministrelli's who instantly set his workmice to the task of a hundred new ballet shoes. He himself would deliver them with the pink shoes to Madame La Rosbif. Madame La Rosbif drove her students almost to tears but disciplined them until they were quite formidable in the ballet. Mr Jones received pieces of music every night which he practiced and played with some amusement and much pleasure. The Duc's violin took four days to make, for it was inlaid with the most intricate and beautiful marquetry. The tuning keys were made of mahogany and mother of pearl. When it was ready, Mr Jones set the strings and rosined the bow. He had received a note written in the neatest and tiniest hand. It requested him to play the music at 8 o'clock that evening and to clear the table. It also requested him to keep the cat, Grimwade out of the studio also. He was curious enough that he brought Mrs Jones and Janie to the studio that evening. They were thrilled at the sight of the beautiful violin. But they were curious and amused at the note. It was agreed that they would comply with the note and see what should happen. Janie removed the cat to the kitchen where the cook kept a sharp eye on him. Grimwade however, settled himself by the fire and fell asleep in it's warmth. Madeleine cleared the table and prepared her own violin to harmonise with her husbands. The family waited then for 8 o'clock. To their surprise the studio was soon filled with mice. They sat upon the workbench, upon unfinished violins and about the table. A small fashionable mouse dressed in a red velvet gown and much lace addressed the mice and introduced her corps de ballet. The mice took to the stage and another mouse with a serious look conducted Mr and Mrs Jones. The mice cheered and the Jones' laughed with sheer joy. They put down their violins and applauded too. That is the tail of the Mouse Ballet. Madame and Griffin - it is indeed a lovely story. I love the painting too. Glad I stopped by. That was delightful. I love the image of Melissa Mouse writing music with her tail dipped in ink! Just when I get too wrapped up in my daily life, a shining reminder of the creative process comes along and resets my clock. Thank you a thousand times over for a little piece of bliss. Very timely, Dearest Griffin. You are welcome O Knifethrowing one! David, I thought of those notes with their own tails and they just had to be written with a mouse tail. Do visit the blog and see the other tales/tails! There is a list of other blogs worth a visit too. I've just added some as well. There are another two stories up since that one. I'm letting another story slowly ferment in my mind, which is the closest I come to baking bread! KYH and Rainey I bow before your bread-making might! I am not worthy... tho' I'm good at eating it. Also check out the blog of the Goddess in the Kitchen - a fabulous giggle. here be the blog to which Mr Griffin refers...oh my those stories he weaves! Madame and Griffin, you should both add your blog to the website details in your C&Z profiles, so people can find it easily. trust the smart and wondrous Jude to think of something like that..
can I believe G's imagination...stretches far beyond the cosmos methinks!